Des sees Melanie doing aerobics and tells her she looks good. Melanie gets embarrased and puts a dressing-gown on. Todd warns Matt off Melissa. Matt tells Todd that there's nothing going on with him and Melissa - and besides, Melissa is just a kid. Todd isn't convinced because Melissa has been hanging around Matt's place a lot. Matt says he's going out with Lee and even if he wasn't, Melissa is way to young for him! Todd eventually accepts this, but is still worried that Melissa has a crush on Matt. He wants Matt to set Melissa straight at her piano lesson this morning. Matt reluctantly agrees. Hilary tells Bronwyn that she'll have her hands full with Sharon - and looks rather upset that Sharon is so pleased about leaving. Melissa arrives for her piano lesson. Todd is filling Nick in on his confrontation with Matt. Nick tells Todd that he should try to control his jealous streak - besides, Todd had Cody hanging around him when Melissa was away. In the kitchen, Beverly is picking at her breakfast and worrying about the counselling session ahead. Jim gets off the phone - Deborah has decided to put Rhys up for adoption and is insisting that he and Beverly aren't allowed to adopt him. Beverly is horrified and totally panicked. Jim reminds her that they have no claim to Rhys - the authorities will be there to take him away in a few hours. Hilary is giving Melissa a post-mortem on her piano lesson as they pass Matt, who is sitting on his bike. When Hilary has gone, Matt has a private word with Melissa, telling her rather awkwardly that Todd thinks she has a crush on him. Melissa starts to laugh and is delighted that her plan has worked. She explains to Matt that she wanted to shake Todd up a bit over his jealousy. But now she knows that Todd has been upset, she's sorry she did it. She starts worrying that Todd will dump her, so Matt gives her a hug to cheer her up. Todd comes out of the Robinson house and sees this. He does not look impressed. Beverly and Helen are getting Rhys's things together while Hilary sympathises - after all, she knows how hard it is to give up an infant. Hilary and Helen leave Beverly to have some time alone with Rhys. Beverly looks for something for Rhys to wear then suddenly looks determined. BEVERLY: I can't let them separate us, Rhys. I just can't. Todd comes over to Melissa who is sitting on the grass outside No.30. She tells Todd off for threatening to hit Matt. They apologise to each other for their actions and agree to get back together. But Melissa doesn't seem overly keen for all that, and heads off quickly to help her mother with lunch. Sharon is pashing a guy called Rick on the sofa when Bronwyn comes in. 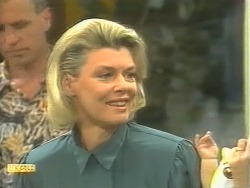 Bronwyn is not impressed and calls Sharon into the kitchen, telling her that "no guys without permission" is a house rule. Also, Sharon is meant to be keeping the place tidy and it looks like a tip. Sharon accuses Bronwyn of nagging and Rick joins in, but Bronwyn sends him packing. Sharon storms off to her room. Nick is relating Todd's jealous streak issues to Lee at the counter. Matt comes in and tells them that Melissa was just pretending to like him to get back at Todd. MATT: I feel so used! Jim comes in and Helen tells him that Beverly has gone - when she came back in from the garden, Beverly had done a runner. Sharon is still in a bad mood and Bronwyn tells her off. She says that Hilary was right about Sharon - that she needed an eye kept on her. 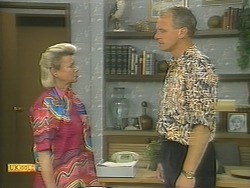 Bronwyn thinks her and Rick were pretty full-on considering they've only known each other a couple of days. She says that Sharon is going out with lots of guys - and suspects that Sharon is going all the way with them. Sharon takes this in silently and then stomps off. Helen is ringing around Beverly's friends and work but no-one has seen her. But just then, Beverly comes in. She had decided to shoot through, but came to her senses in the car. Sharon is sulking in the Coffee Shop and telling Lee that she's angry with Bronwyn. Melissa comes in to tell her she has a problem - Sharon's idea about making Todd jealous worked, but a little too well - now Melissa really has fallen for Matt. MELISSA: I think I'm falling for him, Shaz. Everyone, including Nick and Todd, are waiting for the authorities to arrive to take Rhys away. 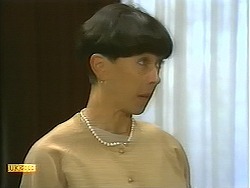 Presently, a lady from the adoption agency arrives and Beverly starts to cry. Rhys is bawling his head off too. BEVERLY: Goodbye, Rhys. I know you'll never remember me, but I'll never forget you! She sobs as she hands him over, and Jim and Helen try to comfort her.